Well we have to give it to the Air Jordan design team. They really did it this time, they designed another unforgettable sneaker for Team Jordan. This sneaker has designs from every sneaker that MJ played in during the year that he captured a NBA Championship. This premiere sneaker is only fit for a championship player like Michael Jordan, himself. The Six Rings Jordan Shoe has features from each shoethat Michael played in the year he captured a NBA Championship Ring. It has the Rubber heel loop from the Jordan VI, the snug inner bootie from the Jordan VII, the unforgettable straps from the Jordan VIII, the patent leather and mesh upper from the Jordan XI, the TWO 3 tongue insignia and lacing from the Jordan XII. 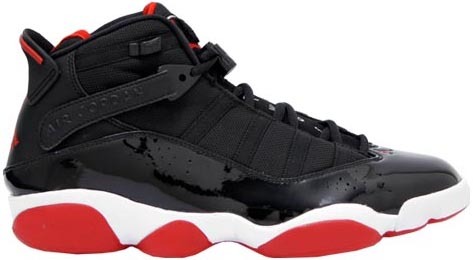 These sneakers also include the Jordan XIII midsole design and the jumpman logo on the toe of the sneaker from the Jordan XIV sneaker when MJ made the unforgettable buzzer beater shot to win his final championship ring over the Utah Jazz. This shoe is one of the greatest Air Jordan sneaker ever designed.